One of the lousier of the short stories movies, with way too many characters and uninteresting plot lines going on. New york i love you might have a great cast, but it still doesn’t really work. it’s a short story movie that doesn’t seem to know how short story movies are supposed to be made. for example, there are a ton of stories, filled with many characters, and all of them are very brief. not only that, but the characters barely appear in more than one story. sometimes they do, but it’s not often and very, very quick. all of this is the opposite of the way this kind of movie is meant to work, and there’s good reason for the usual formula. 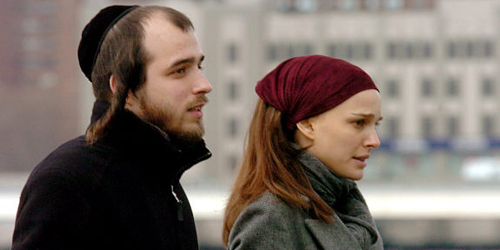 there’s the natalie portman story where she shares a moment with a jeweler as they discuss the limitations that their religions put on them. they have a connection with each other, and it’s nice, but it’s also really just one quick moment. that’s the basic idea of this film. when ethan hunt meets a woman outside a bar, the story is only as long as the two of them can stand on the corner talking to each other. after they leave, not only is the scene over, but so is the story. i suppose that’s the premise of this movie…let’s tell stories that are each no longer than one scene, and see just how much fun we can have in that scene, but then there’s the anton yelchin – james caan story which is actually longer than one scene, and a real short story, the way we are used to. and that story, directed by brett ratner, happens to be far and away the best story of the movie. it’s the one where the boy is dumped by his girlfriend on the night of the senior prom, and gets a surprise replacement for a date. what ends up happening in central park makes it a night to remember. and the paul simon song, the only living boy in new york, played with shots of central park, is just perfect. there isn’t one other story that is nearly this great in the movie, but one or two of the other ones isn’t bad. the two other pretty good ones both deal with two characters meeting each other on the sidewalk outside of the place where they were. there’s the ethan hawke story and then the chris cooper story. hawke meets a girl who he is trying to seduce and delivers a fantastic monologue about what he will do to her, just to learn something about her that punctuates the story with a hell of an ending. chris cooper’s story, meanwhile, isn’t quite as good, and that’s because all there really is to it is a final surprise ending. it’s about two strangers meeting outside a restaurant as the girl tells him about her husband. the girl is played by robin wright penn and she lets loose on this stranger, telling him all about her problems. by the end of the story, we learn that these people were not exactly who we thought they were. without that final surprise, however, the story would be just average. and these are the three best stories of the movie. all of the others are much weaker. there’s the little girl’s father who spends the day with her in central park and is mistaken for a nanny by some onlookers. then there’s the orlando bloom story where he has never met his editor before and now suddenly meets her for the first time. there’s also the hayden christiansen story which opens up the film, as he meets a girl in a bar, tries to pick her up, and ends up getting cut off by her boyfriend, andy garcia. all of these stories have little quirky points here and there, but nothing really special about them. for example, in the christiansen story, the idea that we are meant to be impressed with is that christiansen is a thief, who has stolen from the girl in order to find a way to start talking to her. but the guy she’s dating is an even bigger thief than him. that is another example of a story with a sort of twist ending, and not a whole lot more. some of the stories don’t even have that. there’s the one with bradley cooper meeting drea de mateo for example. they ride to meet each other, with voice over monologues playing their thoughts, and end up meeting in a cab. they start making out from there and the story ends. there are stories of older couples, like the one that walks around coney island, and younger couples, like justin bartha and his complaining girlfriend. then there are in between stories, like the older singer who shares a strange moment with a bellhop at a hotel (played by shia labeouf) who may or may not have existed. these stories are all one noted and that’s a huge part of the problem. 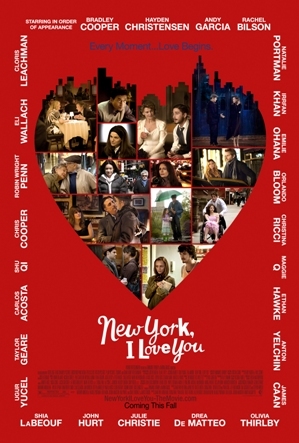 there’s no unifying plotline that connects them all or common theme other than that they all take place in new york. there have been many movies that use the connecting short story formula, from short cuts to sidewalks of new york, but this movie seems to be the laziest of them all. it acts as if the only thing that matters is the final punchline. a good short story should be punctuated by the ending, but that shouldn’t be the only thing it has going on.